She hadn't had a bath for a month of Sundays, so everybody called her Dusty Locks. But Trouble was her middle name. Way out West live three bears who like to keep their cabin neat and tidy. 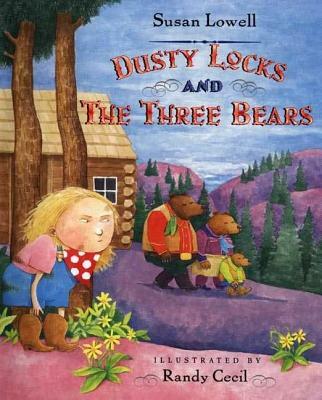 But one day while they're out for a walk, a dirty little girl named Dusty Locks barges in. When the bears come home to find their nice, neat house looking like it's been hit by a whirlwind, they get riled-and Dusty Locks runs home so fast the dust doesn't settle for a week. The talented team that created Little Red Cowboy Hat works its hilarious magic again in this lively Western retelling of Goldilocks, now available in paperback for the first time. SUSAN LOWELL’s books include The Bootmaker and the Elves, winner of a Spur Award from the Western Writers of America. She lives in Tucson, Arizona.